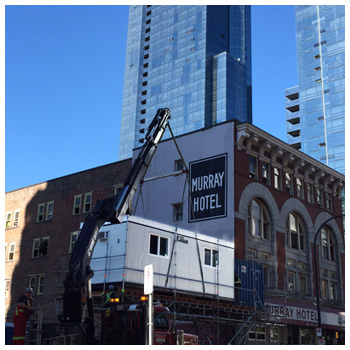 Fort Modular’s installation of a modular site office at Davie and Hornby (near the Murray Hotel in Vancouver, BC) is the first step in the construction of a gorgeous new tower of apartments called the Addition at the Law Courts. This new condo features the talented team of Kenstone Properties, Henriquez Partners Architects, Rennie Marketing Systems, Kodu Design, and the Quorum Construction Group. Construction just started and Fort Modular’s rental construction site office will be home to the Quorum Construction group’s site workers for the next year or so. If you are interested in a modular building rental, contact Fort Modular. 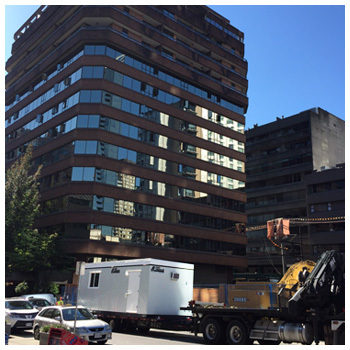 Fort Modular Construction Site Office being transported Downtown Vancouver by PointBlank Installations Construction Site Office being craned into place at new Condo construction site in Vancouver (next to the Murray Hotel).